This history is based on correspondence, records and interviews from many different sources. History is an ongoing story and finer resolution of understanding is always sought. Individuals having additional information, documents or photos related to this story, or differing viewpoints on the meaning of what is revealed by the related correspondence are encouraged to submit them for inclusion in this archive. Most of the documents referenced here require Adobe Acrobat Reader version 3.0 or later for display. October 22, 1956 -- Mr. Jacques Weiss outlines some preliminary ideas for a French translation in a private correspondence with Carolyn Brown. [Display] Jacques Weiss was a French industrialist, an aviation expert, and former leader of the underground resistance to the Nazi occupation and an ardent truth seeker. He brought a comprehensive set of talents and resources to bear upon the task he undertook. August 21, 1960 -- Weiss visits Chicago to discuss issues related to the publication of his translation. [Display Weiss' schedule for Chicago visit] With Dr. Sadler, Weiss discussed the inclusion of Bible cross-references and other footnotes in the text as well as the publication of the text in three volumes. Dr. Sadler is reported to have encouraged Weiss to proceed with his plans and included these provisions in the contract. Urantia Foundation was to hold the copyright and Weiss was to be the publisher. Urantia Foundation also paid Weiss a modest sum to cover certain expenses associated with bringing his project to completion (reported to have been $1,200.00). Weiss was the person who had the plates made, who directed the printing, made the contracts with the printer and the distributor, and therefore actually was the publisher instead of Urantia Foundation. This was all according to the contract which he had arranged with Dr. Sadler. The contract provided Weiss with the permission to advertise his translation, partially even at the cost of the Foundation. Even more, the Foundation itself, who became co-distributor, reserved for itself the right also to advertise the translation. To promote further the sale of books, the contract stipulates, "because of the size of the book and its cost", that the translation may be published in three volumes and sold separately. To promote further the sale of books, the title of the Urantia Book was changed to ‘La Cosmogonie d'Urantia, "The Cosmogony of Urantia", which was accepted by Urantia Foundation. July, 1967 -- Weiss publishes "The Origin of The Urantia Book" [Display Weiss' document] Supplies of "La Cosmogonie" are running low and Weiss is anxious to reprint. August, 1967 -- Edith Cook finds an error in the diagrams Weiss included with the French text. Weiss had printed extra diagrams and sent them to Urantia Foundation as Christmas cards. Weiss had shown dark gravity bodies as existing in unpervaded space as well as in pervaded space. Edith pointed out that there was, according to The Urantia Book, only one belt of dark gravity bodies and that this was in pervaded space. Edith considers this to be a "major error" and reports to the trustees that "His concept would change our whole idea of the shape of the master universe." She further comments that she sees these maps as misrepresenting the teachings of The Urantia Book. August 25, 1967 -- Jacques Weiss meets with trustees in Chicago to discuss issues related to the second printing of "La Cosmogonie," during which time the error on his diagram is reviewed. Weiss finally gave up in frustration and said he was not going to redo the maps at this point, that he would use up the ones he had, and perhaps would take up the matter at a later time. November 9, 1967 -- Weiss expresses frustration with what he sees as Urantia Foundation's hyper-vigilant concern about the spread of the revelation. Excerpt from his letter to the trustees: "Before 1955, the Forum, who held the manuscript, was centered on the waiting aspect. Several members believed that the Book would not even be published during their lifetime. Then the Hierarchy judged that the situation had matured and the time had come. They gave the green light for the publication with instructions to go slow, even very slow for the beginning. You have remained ever since in that position of first gear, without any further contact with the Hierarchy. Now they judge that the time has come to pass in second gear, not in high. But have you asked them? Obviously no. On the French side, we have constantly been helped by guardian angels and other entities who suggested and approved the passing in second gear, and furnished the corresponding opportunities. You have witnessed the results. We believe in their guidance and follow it, looking more lightly at the legal viewpoint since a spiritual, moral, mental and physical agreement exists between us." Note: Documentation for much of the following is contained in the records of the court proceedings in France and may be found in the "Final Judgment" document issued by the court. This is a rather lengthy document and may be slow to display on your monitor. The key points are outlined here. Dr. Sadler granted permission allowing Weiss to proceed with his second printing with contractual conditions similar to the first printing, except for a few modifications. These were: The second printing is to be limited to 3,000 sets (changed by letter of April 8, 1969 to 4,000 sets to allow Weiss a more economical printing run); an agreement that the footnotes would be republished as recently corrected, the book would again be published in three volumes, and a note would be added to the front protective page of each volume indicating that the footnotes were added by the translator and were not a part of the English language edition. The second printing of Volume II was completed on April 14, 1969, Volume I on November 28, 1970, and Volume III on March 10, 1971. However, some 2,000 copies of Volume II from this second printing had been damaged and could not be sold. This was 2/3 of the entire production run of the second Volume. April 24, 1972 -- Jacques Weiss, ready to proceed with a reprinting of Volume II for purposes of replacing the 2,000 copies damaged in 1969, is informed by Urantia Foundation that they will not authorize him to proceed with this printing. Urantia Foundation also indicated that they would not allow him to include in any future editions, the Bible references approved by Dr. Sadler for both the first and second printings. (It is also interesting to note that, following the death of Dr. Sadler, Urantia Foundation discontinued the selling of his studies which related the Bible to The Urantia Book, citing numerous "errors" as the reason for the discontinuance). Meredith Sprunger comments on this: "I recall that the Foundation trustees thought that Dr. Sadler had been 'taken in' by Weiss and was too cooperative with him. Dr. Sadler was very aware of the evolutionary relationship between the Bible and The Urantia Book. The early power structure of the Brotherhood and Foundation were not sympathetic to this relationship and to institutional religion. I am not surprised that the Foundation stopped selling his Biblical Studies. Had Dr. Sadler lived another 25 years the history of the movement would be quite different." May 11, 1972 -- Weiss places an order with Romand & Beurel in Paris to print additional copies of Volume II to replace those which had been damaged. However, instead of simply replacing the 2,000 copies which had been damaged, he ordered 5,500 copies from the printer, supposedly due to economies of scale related to printing costs. Urantia Foundation declared this a contractual violation and used it as a basis for initiating a lawsuit against Weiss in 1973 for purposes of gaining control of the French text. August 1973 -- Thomas Kendall elected President of the Board of Trustees of Urantia Foundation. November 10, 1973 -- Agents for Urantia Foundation confiscate from Weiss and his printer, receipts which might reveal printing quantities in excess of the number contractually specified, along with a seizure of printing plates and film. Urantia Foundation also succeeded in getting a restraining order from the French authorities which prohibited Weiss from proceeding with the publication of his Concordex and his Glossary. 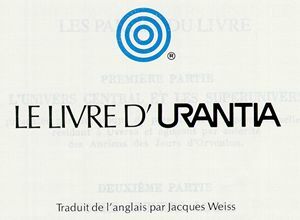 Weiss was also charged with trademark infringement for registering and using the phrase, "Editions Urantia," to identify his French publications related to the revelation. (Weiss also had a white strip of paper pasted over Urantia Foundation's copyright notice in the remaining copies of Volume II which the court subsequently ordered him to remove). November 11, 1973 -- Urantia Foundation notifies selected readers in a carefully worded announcement that a lawsuit against Jacques Weiss is being initiated in order ". . . to sieze copies of an unauthorized translation." [See copy of Urantia Foundation lawsuit announcement] Urantia Foundation filings also charged Weiss with "infidelity of translation." The court threw out this charge because Urantia Foundation was unable to provide any substantiation of it. Weiss admitted to having made changes of punctuation and spelling but noted that these changes had not altered content of the text itself. Urantia Foundation also complained that Weiss had distributed books in Canada when his contract limited him to distribution in France. The suit against Weiss essentially brought sales of the French translation to a halt. The price of underground photocopied editions soared to over $200.00. These were supplied to French readers through the efforts of Andre Heisse working in and around Paris. Heisse and his co-workers evaded apprehension by agents of Urantia Foundation by frequently moving their equipment and generally conducting their operation as did the Resistance propagandists during World War II. August 8, 1974 -- Agents for Urantia Foundation undertake additional seizures in the Weiss case, taking from the printshop of Romand & Bueurel and from Weiss' book distributor, Sarl Dervy-Livres, 100 copies of volume II printed in excess of the number allowed by Weiss' agreement with Urantia Foundation and the first 25 pages of Weiss' Concordex. November 13, 1975-- Judgment handed down by French court in Weiss case [See copy of Judgment] Rather than resolving the issue, a stalemate ensued. 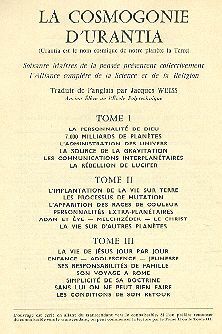 The Foundation, owning the copyright, stopped the further printing of "La Cosmogonie," while Weiss, having the legal moral right of a translator, prevented a revised edition from being published by the Foundation. Needless to say, the relationship between Weiss and Urantia Foundation had become very bitter. Weiss being the personal center of the whole Urantia movement in France, this enmity did not remain limited to the relationship between the Foundation and the person of Weiss; it pervaded the whole of France and farther. 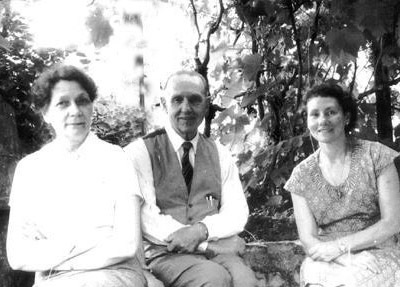 Summer, 1977 -- Mr. and Mrs. Henry Begemann from the Netherlands visit Urantia Foundation to discuss problems in Europe resulting from the Foundation's withdrawal of the French translation from circulation as well as issues related to Henry's work on the Dutch translation. 1980 -- Urantia Foundation begins search for English-French translators who can continue their effort to create a new French translation. In November of 1980, Nigel Hornby, who had been working on this task in Paris dropped out of the effort after partial completion of only ten papers. Hornby provided an important critique of the Foundation's expressed desire to do all translating in the U.S.
Weiss died in 1983. According to a long-time acquaintance who was present with Weiss on his deathbed, Weiss died a broken man. He felt that the initial enthusiasm and support of Dr. Sadler for his translation and his work at spreading the revelation in France had been betrayed by the emergence of Urantia Foundation trustees obsessed with a policy of complete control of the revelation following the death of Dr. Sadler. He expressed deep dismay at the fact that the visionary excitement with which Dr. Sadler approached the spread of the revelation was so soon being replaced by a bureaucratic determination to create a secular institution out of Dr. Sadler's life work. The final blow to Weiss was Urantia Foundation's re-publication of his translation. After all the talk about "errors," Urantia Foundation published a photographic reproduction of the original Weiss text with only the page numbers changed, making the years of work which Weiss had put in on a Concordex useless, effecively assuring that his Concordex would not appear on the market. Immediately upon Weiss' death, Urantia Foundation succeeded in getting Weiss' daughter to sign over all her inherited rights to the translation. Autumn, 1991 -- Under the direction of present Urantia Foundation trustee, Georges DuPont, typesetting of Urantia Foundation's revised Jacques Weiss translation begins in Paris.